Growing up is different for everyone. We each have a struggle or situation unique to us. In CODA, we get to hear about a beautiful story about growing up as a child of deaf adults. 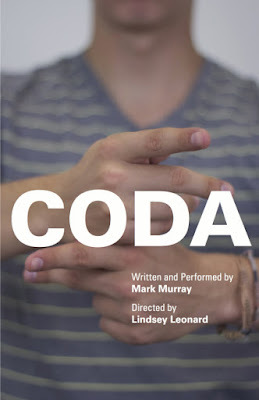 Written and performed by Mark Murray, CODA chronicles his life as the son of two deaf parents. Part monologue play, part character driven, CODA is an inspiring celebration of one young man's perfectly normal childhood. Murray is completely engaging in his delivery. His direct addresses are his strong suit. But what Murray has on his hands are two very strong separate pieces. First is an informational piece recalling the events of his life. The other is a plot driven character play. What Murray needs to do now is break the two apart to create two brilliant companion pieces. And he has all the pieces to make two great works. As a solo piece, Murray shines brightest when he was telling stories. His anecdotes were beautiful. One striking story Murray shares is how his father's siblings never learned sign language. It's absolutely heartbreaking. If Murray elaborated on the monologue form and broke the language barrier by teaching us what others didn't care to learn, I think it could be a stunning moment. On the flip side, the scenes that Murray acts out are ripe for a straight play. While the scenes didn't resonate as much as the monologues, the most touching scene was the one done in complete sign. No sound. And yet, the impact was screaming. In a play form, watching two people have this moment would be infinitely captivating. To guide Murray through his journey, director Lindsey Leonard did a solid job. Leonard allowed Murray to live in the moment and not linger. For the most part, Leonard assisted in finding a physicality for each of Murray's characters. It's just unfortunate that the majority of the staging was stationary. Additionally, Samantha Kuperberg should be recognized for her work. Kuperberg served as the ASL Interpreter. You can’t help to take a peak at her at moments and she was just as engaging as Murray. Too bad Murray and Kuperberg didn’t interact. There's a strong chance that when you walk into CODA, you may not know a lick of sign language, but I can guarantee by the end, you'll understand. And it's all due to the incredible work done by Mark Murray. The moral of this story is we are all the same. We just hear differently. Mark Murray has created something of note. Book this kid on a national school tour stat.